Holoholokū at Wailua on Kaua’i was one of two places in Hawai‘i specifically designated for the birth of high ranking children; the other site was Kūkaniloko near Wahiawa on Oʻahu. Here all the kings of Kauaʻi were born, from earliest times to King Kaumualiʻi. Aliʻi from other islands would also come here to give birth. Kaumuali‘i was the only son of Kamakahelei and Kāʻeo (his mother Kamakahelei ruled the island when Captain James Cook made ‘contact’ in 1778.) Kaumualiʻi was born the same year at Holoholokū. Kaumuali‘i became ruling chief of Kaua‘i upon the death of his parents. It is said to be the oldest heiau on Kauaʻi and was named for a foster parent of Kawelo, son of Kauai’s ruling chief Mano-kalani-po and his wife Ka-wai-kini early in the 17th century. 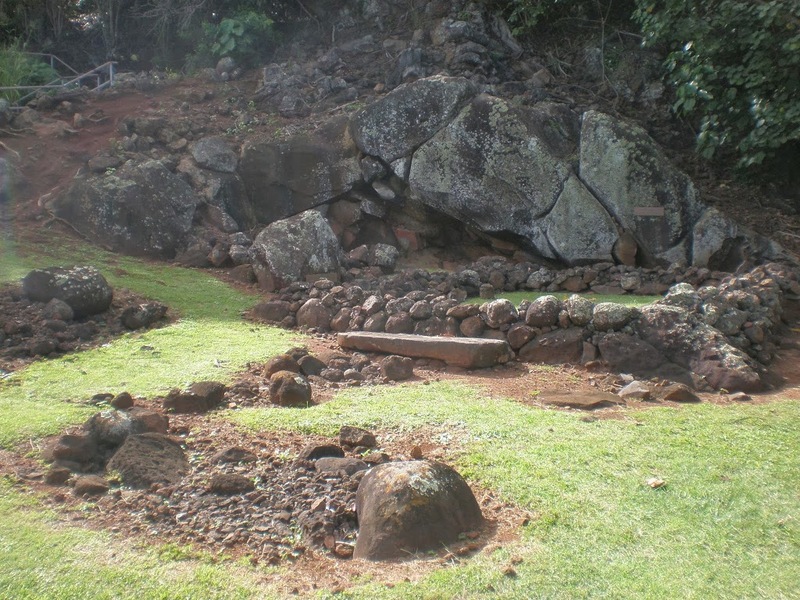 Two boulders are within the heiau; the pōhaku hānau (birthstone) is actually two rocks. Expectant mothers sat on the flat rock and rested her back on the other; when in use, the rocks were enclosed in a shelter and the rocks were covered with mats and kapa. The image shows Holoholokū. I have added other images to a folder of like name in the Photos section on my Facebook and Google+ pages. Charles Lono Kelekoma is an ancestor of mine from Kauai. Charles was one of the most prominent and politically active residents of Wailua. We are still trying to piece together our Kauaian ancestry, but it seems apparent that Kelekoma–his father–hanai’d their oldest son (Mano-kalani-po) to another Wailua resident (his brother, Hakakoele). Mano-kalani-po (1851-1922) is my great-great grandfather. If you wanted to chat further, my email is hberlioz@gmail.com (Joel Neves).